Pink, yellow, blue, multicolored or with heels and brillantino version, but with the inevitable ‘flag’, remain the world’s most famous flip-flops. For over fifty years (the first flip-flops back to 1962) the Brazilian Havaianas held the bank began in the summer and also in 2015 the legendary soft-soled flip-flops, but indestructible, are the most preferred. 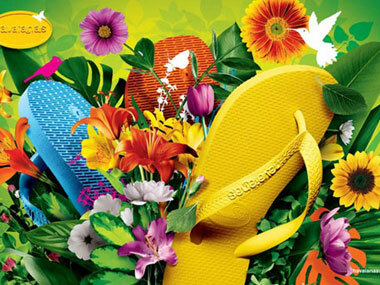 Havaians, the legendary flip-flops from Brazil – which are worth about € 1 billion of net sales in 2014 – managed to conquer the five continents. From Los Angeles to New York, from Madrid to London from Tokyo to Sydney, becoming a sort of icon and a cult of celebrities who wear them also with the evening dresses, and ordinary people, who use them, more willingly , to go to the beach. The first model of Havaianas was the sole white and blue stripes. The source of inspiration was the Japanese ‘Zori’ typical thongs of black cloth-soled brown rice, and even today on the sole of the ‘Brazilian’ is reproduced grain of rice, which makes them unmistakable. Over the years, the design and collaborations with renowned designers (among them, even Missoni) have made it the most sought after and Havaianas ‘multitasking’. Today, the hallmark of the factory is mainly the rainbow of colors that are available collections. meters dedicated to the brand and to its proposals. It is not excluded to open within a year of a space dedicated to Rome. Alpargatas also because it is not only flip-flops, but espadrilles, sandals and boots, and – in Brazil at the time – also a clothing line.